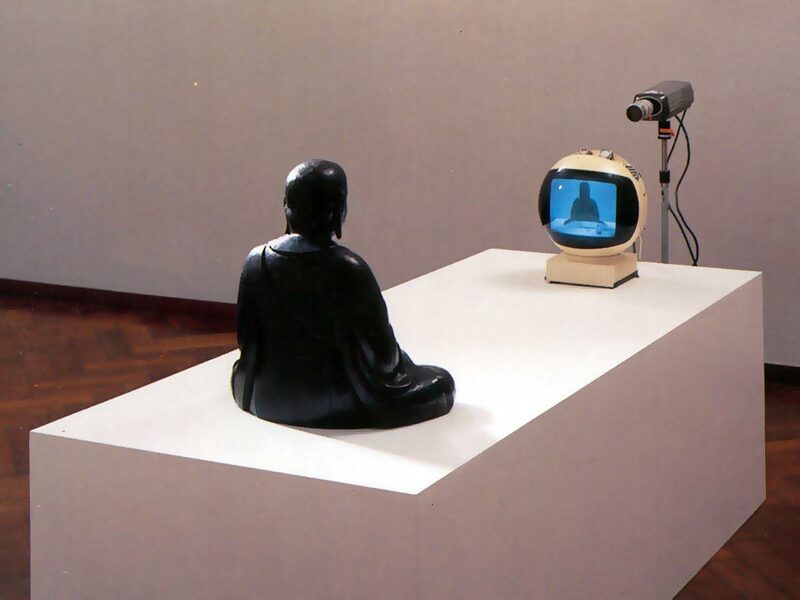 Buddha Duchamp Beuys 1989 is one of the variations of Nam June Paik’s iconic installation TV Buddha. The former was shown in a Paik retrospective at the Kunst Palast Museum in Dusseldorf in 2010. 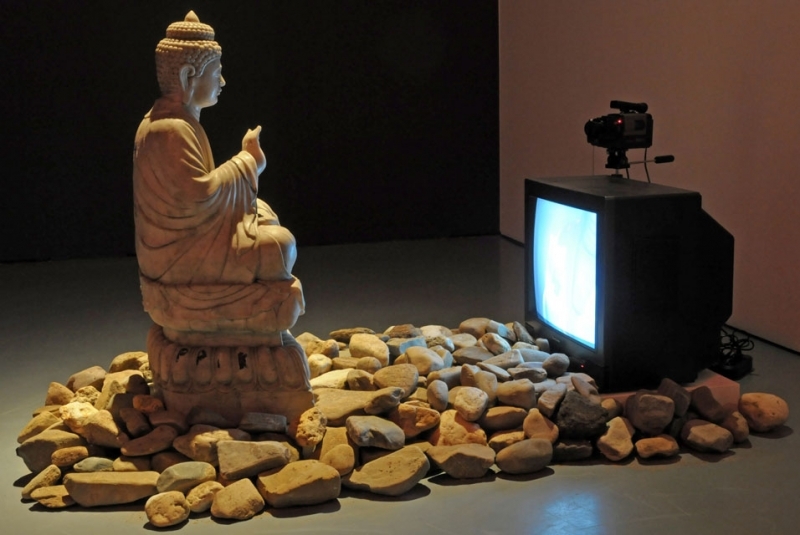 Paik created TV Buddha in 1974 at the end of the first generation of television culture. 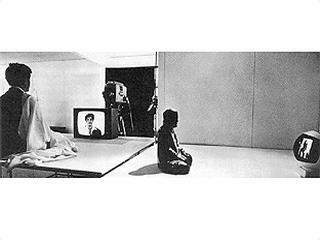 It featured a statue of the contemplative Buddha sitting before a small television behind which was a closed circuit camera recording his image. You see mile after mile of darkened houses with that little electronic screen flickering in the room, everybody isolated, watching this thing; and, thus, in no real communion with each other at all. And this isolation of people into a private world of their own is really the creation of a mindless crowd. Google Street View is a frequently updated archive of location images. Contemporary artists have begun to incorporate those images into their work, resulting in gallery and museum exhibitions and sales of prints. This practice has also generated controversy as to whether the images actually belong to the individuals using them. It is a question of the authenticity of the image – a debate that has raged in various forms since the early history of the medium. In 2011, German photographer Michael Wolf was awarded an Honorable Mention in the Contemporary Issues category of the World Press Photo Awards. 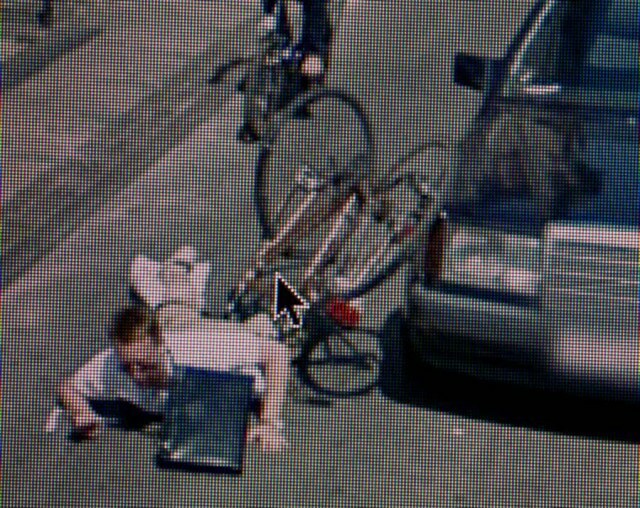 Wolf’s award became highly controversial among other photojournalists, since the winning work was deliberately appropriated from images found via Google Street View, which Wolf then cropped and re-photographed on his computer monitor. Wolf argues that the very act of appropriating specific sections of images within a vast data stream and photographing them make the images uniquely his. His intelligence, editorial skill, and intuition bring attention to facets of the world that would otherwise go unnoticed and remain lost in the Google Street View image archive. Another photographer using Google Street view is Doug Rickard. His recent appropriated images show areas of the United States where “unemployment is high and educational opportunities are few.” Taking a virtual tour of those areas, Rickard isolated and digitally captured particular scenes that commented on “poverty and racial inequality.” The resulting series of images was published in a book entitled A New American Picture and exhibited in New Photography 2011 at The Museum of Modern Art in New York City. Street View and Beyond: Google’s Influence on Photography (Time Magazine, October 24, 2012).